SYRACUSE, N.Y. - Two employees at the SUNY College of Environmental Science and Forestry (ESF) have received Chancellor's Awards for excellence. Kevin J. Guerin, an instructional support specialist who maintains millions of dollars worth of sophisticated scientific instrumentation, received a Chancellor's Award for Excellence in Professional Service. D. Andrew Saunders, a research associate who specializes in natural history interpretation, received a Chancellor's Award for Excellence in Teaching. Guerin is a resident of Hastings. He was recently named ESF's coordinator of instrument and equipment repair and fabrication services. In his position with the college's analytical and technical services office, he oversees the repair and maintenance of 1,400 pieces of laboratory equipment that have a combined value of more than $15 million. The various pieces of equipment are used by faculty members and nearly 600 graduate students who are responsible for some 250 funded research projects. In Guerin's nomination statement, several colleagues praised him for innovation and cost-effective work in producing and maintaining highly specialized electronic equipment. The list of equipment for which he is responsible includes the college's nuclear magnetic resonance unit, gas chromatograph mass spectrometer, x-ray instruments, and electron microscopes. "I'm learning as much as I brought here," Guerin said. "My experience has broadened in the field of lasers, environmental and forest biology, and paper science because I had to get to know the instruments the researchers use and the results they're trying to achieve. I've designed and built dozens of instruments for whatever their application." Guerin has an associate's degree in electrical technology from Onondaga Community College. 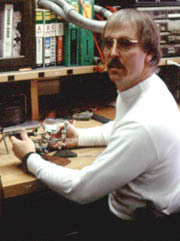 He joined ESF's professional staff in 1988. 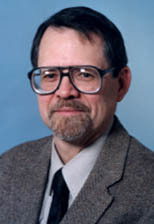 Saunders, who lives in Syracuse, joined ESF in 1985 as a research associate and education director for the Adirondack Wildlife Program at the college's Adirondack Ecological Center in Newcomb, N.Y. In 1995, he moved to the main campus in Syracuse, where he teaches courses in the field of environmental interpretation. The nomination statement that was submitted on Saunders' behalf cited the creativity and commitment he brings to his classes. But Saunders gave his students the credit for his enthusiastic approach to teaching. "The students we draw to ESF are very special individuals," he said. "Every year my enthusiasm grows at the prospect of working with another group of exceptional students." One of Saunders' main projects at ESF has been the development of an educational program for science teachers, called "Stalking Science Education in the Adirondacks." Each summer, about 20 science teachers spend six days in the Adirondacks, learning new ways to help their students discover hands-on science while learning about the environment. The program is designed mainly for middle and high school teachers, although teachers from kindergarten through college are invited to attend. Classes and field studies take place at Huntington Wildlife Forest, ESF's Newcomb campus. Saunders is also coordinator for educational materials and programs for the newly revitalized Roosevelt Wild Life Station and serves as ESF's liaison with the Adirondack Park Agency's Visitor Interpretive Center in Newcomb. In addition, he supplies illustrations for numerous lay, scientific, and educational publications. He earned his bachelor's degree in biology from the University of Missouri at Kansas City and his master's degree in wildlife ecology and animal behavior from Utah State University.